I combined the Frenchie with the Box of Chocolates file to make this sweet shaped card. 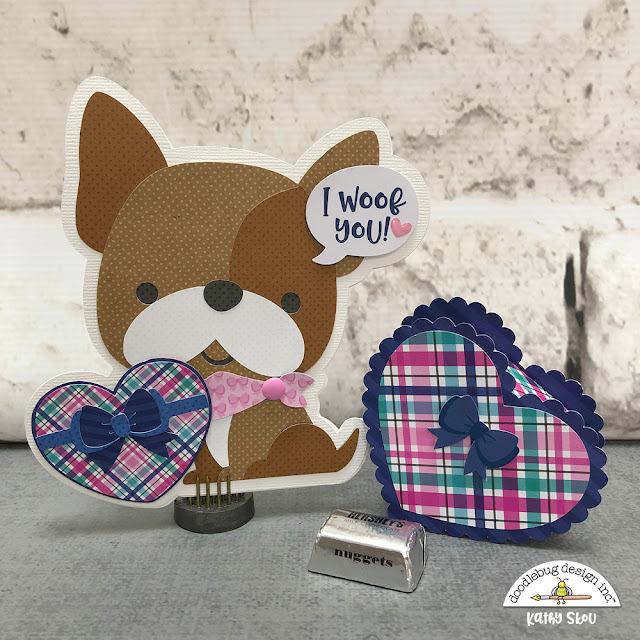 I used the 6x6 pads for both the French Kiss and Dot Stripe Petite Prints collections to piece him together. The Chit Chat sentiment was a perfect fit for the card, and then I just finished it with a heart and matte sprinkle! 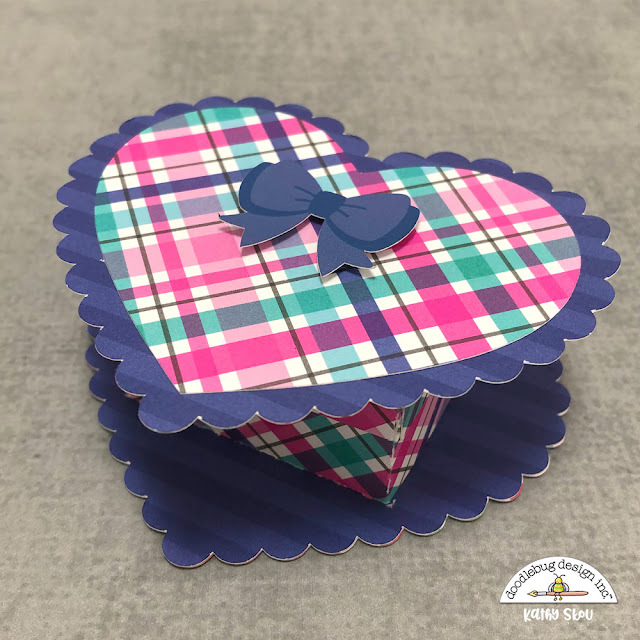 I used the 12x12 versions of the plaid and navy papers from the French Kiss Collection to make the fun little Valentine's nugget box. The box was made from an SVG file, I've linked to it below. To finish it off I added a little bow sticker from the Icons sheet. It opens up and holds 3 mini candy bars! I was thinking I might make another to hold some dog biscuits for my friend's pup! The new French Kiss Files will be available in the Lori Whitlock SVG Shop tomorrow, and in the Silhouette Store soon! 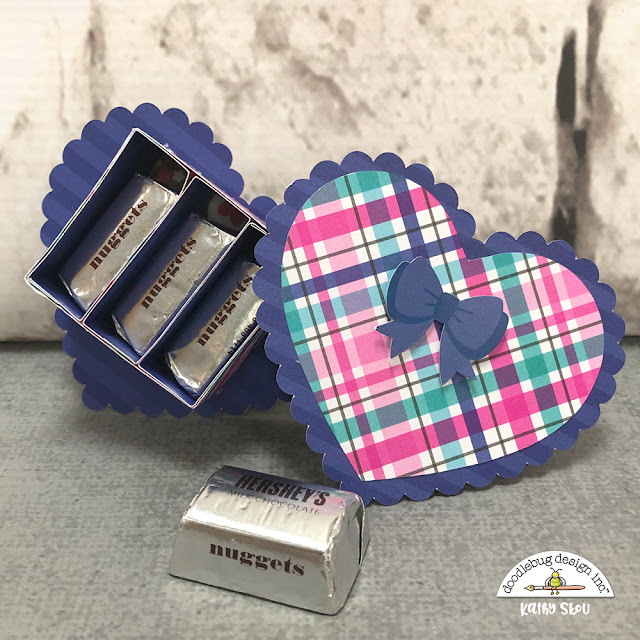 Have you made something with the French Kiss Collection or Cut files? Be sure to tag Doodlebug Design on Instagram (@doodlebugdesign) or Facebook (@Doodlebug Design), we'd love to see your projects! That's it for me today, thanks for stopping by to peek! The navy blue added to this palette is so fab. This is the cutest shaped card and treat box. Thanks for sharing your creativity. Such a sweet card and box! Thanks for the inspiration! Such adorable projects!! Wonderful inspiration!! Kathy, these are so adorable!! 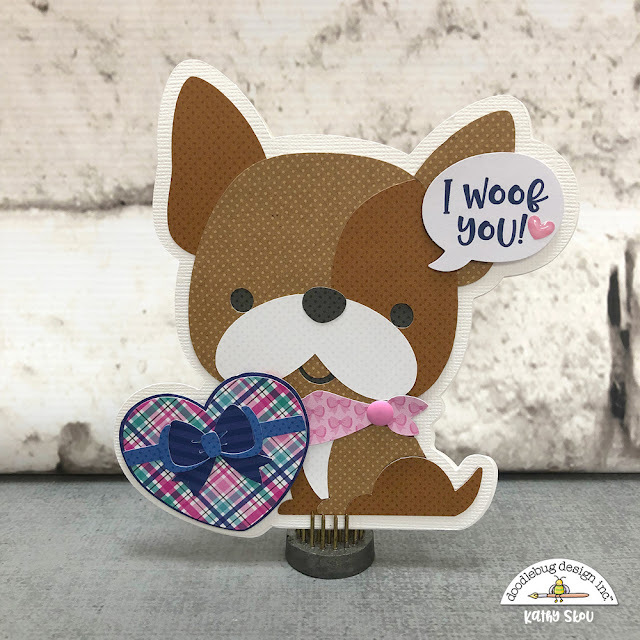 That Frenchie dog card is a delight and we all want to make one!! Now the long wait to get the collection! Am always using the Doodlebug dots papers and haven't bought them in the smaller pad as of yet! That's going to be a regular staple from now on!! Thanks for the inspiration!